No sooner had the sad news spread through the city of the death of Anthony Mary, the mourning then became universal. 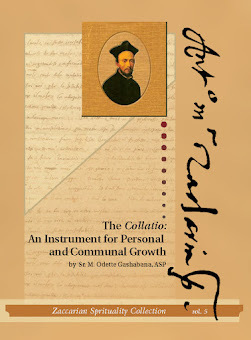 Both clergy and laity, with one voice, extolled the sanctity of his life and his works of apostolic zeal. God wished to testify to his holiness by the following miracle. While the Fathers Ferrari and Soresina were preparing him for burial, they by accident left him a little uncovered. At once, he stretched out his hand and drew the covering over him. He did this more than once to show that he could not bear that, even in death his virginal modesty should be disregarded. The same miracle was renewed when, later on, the Superior General of the Congregation went to visit and venerate Anthony Mary’s sacred body. The funeral was solemn and touching. The body was carried with great pomp to the Parish Church of St. Donato where it was exposed for two days. It would be impossible to give any estimate as to the number of people who flocked to pay their last tribute to the servant of God. Crowds continually came and went; some reverently kissing his head and hands, others touching him with their beads, handkerchiefs and other objects, and some even cutting off small pieces of his vestments to keep them as precious relics. From this arose the necessity of enclosing him quickly in a wooden coffin. The Cardinal Bishop of the city came for the celebration of the funeral service with all his Chancellors; after these, came his spiritual sons with a large following of citizens to transport the remains to Milan. This translation was, indeed, a triumphal procession. Priests and laity came out from the villages and castles where the body was to pass; and forming in procession, all went to meet it carrying crosses, bearing lighted candles and singing joyful litanies such as would be done to honor the relics of a saint. In these pious demonstrations, the people of Castiglione Lodigiano especially distinguished them- selves. The sacred body was laid on an altar in the choir of the convent of the Angelics in Milan where it rested for 26 years remaining, entire and incorrupt. In 1566 an order came from the Holy See that no corpse should be kept on the altars. Anthony Mary was then buried in the crypt that served as a burial place also for the Angelics. 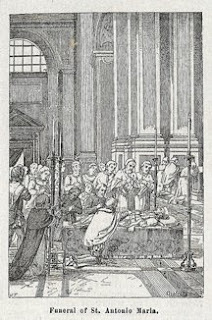 Anthony Mary immediately after his death was, by the unanimous voice of clergy and laity, honored on the altars under the title of Blessed and St. Charles Borromeo himself celebrated the holy sacrifice on the altar where his relics reposed. 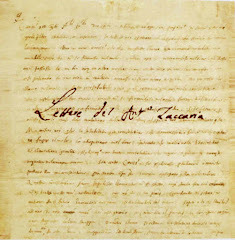 But in 1634, by a decree of Urban VIII forbidding any public honor to be paid to those who had not enjoyed it from time immemorial or by the approbation of the Holy See, the Barnabites took the pictures of their Founder from their altars, and every public honor that had been paid to him for 95 years then ceased. However, the Lord did not cease to make the merits and virtues of St. Anthony Mary shine forth by favors and miracles granted to those who (as was allowed by the law of the church) continued to venerate him privately. Consequently, the regular process of Beatification was introduced. On February 2, 1849, Pius IX, even from his exile in Gaeta, solemnly proclaimed the "virtues of the Servant of God, Anthony Mary, practiced in a heroic degree," and he authorized them to proceed to the further acts for his Beatification. Leo XIII on January 3, 1890 then restoring the ancient devotion, which numerous and incontestable historic documents showed Anthony Mary to have had for 95 years, ordered that he should be honored on all altars under the title of Blessed. The public devotion to their holy Founder being once more introduced, the Barnabites redoubled their efforts to recover his remains. Their zeal was rewarded; for, at last, they found them exactly where they had first been placed and guarded with so much love by the Angelics. They were found on May 8, 1891 in the crypt of St. Paul's, while overhead (in the church) the Blessed Sacrament was exposed for the Devotion of the Forty Hours. The relics recovered, the Barnabites set about preparing them for a suitable crypt in their church of St. Barnabas in Milan, which they looked upon as the cradle of their Congregation. This crypt, not only from an architectural point of view, but for its exquisite ornamentation, is a perfect gem of art. It is in the style of the 15th Century and is divided into three aisles by beautiful little pillars of polished grey granite, and along the walls, other small pilasters corresponding with the pillars support the arches on which the ceiling rests. 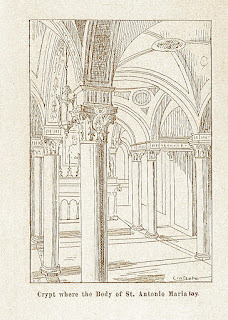 Over the altar is raised a small cupola closed in by plate glass with an opening on the choir of the church, thus permitting the devotions to be assisted. The table of the altar is a single slab supported by small pillars and pilasters in antique style, all of beautiful variegated marble with bronze ornaments richly gilt. On the step which surmounts it, rests the massive gold frame which encloses the miraculous picture of the saint of which we shall speak later. The body of the saint is laid under the altar. Clothed in his black habit and his sacerdotal robes, his head rests on a magnificent cushion. In his right hand he holds a silver lily and his left supports the book of the Epistles of St Paul. When the front of the altar is uncovered for the veneration of the faithful, the body of the saint is seen perfectly. It is then that a marvelous light is thrown on it, a light so brilliant that it eclipses the light of the many lamps that burn around the altar. The solemn inauguration took place on April 9, 1893, in the presence of great numbers of the clergy and prelates and a continuous stream of people of every age and rank. Numerous pilgrimages were also made to venerate the body of the saint. Among these, that from Crema was remarkable — at its close a priest having been instantaneously cured, and also that from Cremona, the saint's native city, which numbered as many as twenty thousand pilgrims. In the meantime, the process of canonization was proceeding rapidly. The miracles presented were approved and, finally, the reigning Pontiff, Leo XIII, raised Blessed Anthony Mary to the supreme honor upon the Altars under the title of Saint on May 27, 1897, celebrating the feast with solemn pomp at the Vatican Basilica in Rome. The crypt, having been described, let us now see what is still more important, how the devotions are carried out, with what fervor it is visited, and what heavenly favors God ever showers down on this spot for the glory of his servant Anthony and for the temporal as well as spiritual good of his faithful clients. Hardly had the crypt been opened and the altar consecrated in 1893 then, as we have already mentioned, there was a constant stream of people from many places going to a most celebrated sanctuary. We have already spoken of the great pilgrimages of Crema, Cremona, and Lodi besides the great numbers who came on private pilgrimages. As this outburst of devotion, far from dying out, was daily on the increase, special services had to be held to satisfy the devotion of the faithful. Mass was daily celebrated at a fixed hour in the crypt in honor of the Saint, after which benediction with the relic of the Saint was given. Every Tuesday after the Mass, the favors obtained through his intercession were read from the pulpit and the new favors asked were then recommended to the prayers of those present. Then, benediction of the Blessed Sacrament was given, which was followed by the blessing with and veneration of the relic of the Saint. What was then established is still followed strictly; moreover, on account of the great numbers who attend these devotions, services are also held on Tuesday evening with special prayers to the Saint and benediction and veneration of the sacred relic. To form an idea of the great favors showered down by Divine Providence in these tempestuous times by the revival of devotion to Saint Anthony Mary, it is enough to count the votive offerings of those who, for favors received, thus publicly testify their gratitude, and the great number of lamps kept (at the expense of the faithful) constantly burning before the shrine. 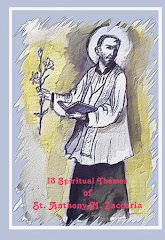 To God alone is known the many graces that are asked in private from this His great servant. In the short space that elapsed between June and November 1893, over two hundred thanksgivings were made from the pulpit for every kind of favor, spiritual and temporal. Of these favors, although only a short sketch is kept, enough remains to touch us and fill us with admiration. Among those who have recourse to the Saint are persons of every age and condition, not only those of the humbler classes but also others of rank, clergy, laity, whole religious communities and entire countries. Favors are asked in every kind of sickness that surgical and medical art has ever dealt with and diseases that have been pronounced beyond the reach of human science. The poor, reduced to dire need, look to him as their supreme helper. Young people and students recommend themselves to him for the success of their examinations, or for help in the choice of a state of life, or that he may remove the obstacles that prevent them embracing the state already chosen. In short, all, old and young, rich and poor come to him with loving trust, laying before him their every want, anxiety, and care. One reads most touching appeals from Christian teachers who recommend their young charges to the Saint that they may grow up pure and holy, fearing and loving God. Among the spiritual favors that are asked are some that go to one's very heart. Many a mother offers up tears and prayers for the conversion of a dissolute, irreligious son, lead astray by bad companions and now a disgrace to his name and a source of bitter sorrow to his family. Wives who ask graces for their profligate husbands who care for neither family nor religion. Poor things! It seems as if they have no moment of calm except the time spent in praying and recommending themselves to blessed Anthony. It would bring tears to one's eyes to read the words of a daughter who asked for prayers that her father return and be reconciled to her mother, or those of a wife who implores prayers for her husband. This veneration, so pure, so fervent, that flows forth before this sacred Tomb reveals much to those who come there to pray. It teaches many important truths even to those who believe themselves to be experienced in and capable of educating their families and promoting the welfare of the people.